I may be a little behind the times, but I finally tried Greek yogurt. I put it off because I LOVE the Dannon Light and Fit, and change is hard. And I'm stubborn. Hey, at least I'm honest. 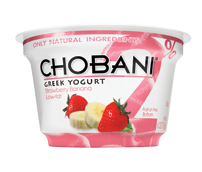 I finally tried Chobani Strawberry and Banana flavor. The flavor is stronger than regular yogurt, but what really converted me is the texture. The yogurt is very thick and creamy. It reminds me of frozen yogurt, but without the sweetness. The fruit is on the bottom, which kind of annoys me. I mean, how hard is it to mix everything up before putting it in the containers? It has about double the calories than my Dannon, but about 3 times the protein, 14 grams! That I can get used to. After I thought about what was keeping me from trying Greek yogurt, I'm not sure why I didn't sample some sooner. The Greeks know food after all. Greek olives, Greek salads, Feta cheese, Gyros...All pretty tasty! I can positively say, I am now a Greek yogurt converter.